So I read this whole thing and I’m lowkey glad that this is more of Nina and Zoya’s story BC I LOVE NINA. also ew what ZOYA AND NIKOLIA nooooo i don’t want that to be endgame at all! thank you for making this spoiler-free bc i was so interested in ur thoughts on this. i’ve read shadow and bone, siege and storm, but not ruin and rising (i know what mostly happens in it tho) – so I think i should be okay to read this? maybe? and loads of people say the 1st half is slow and I’m not looking forward to it at all. lovely review! I definitely wasn’t onboard for Zoyalai, but I understood where Zoya was coming from. Ultimately it just felt like a relationship of convenience, so I wasn’t into it. However, that didn’t detract from my love of the book at all. While The Darkling is certainly gross as a love interest (and I don’t think the story is going that direction ever), I was more interested in him than other more confusing political schemers (*cough* Cardan *cough*). The pacing was definitely more adult fantasy than YA, it was a bit slower than the SoC duology for sure. That being said, I won’t read the Grisha Trilogy again ever because I feel like nothing happens for 2 whole books, but I would reread KoS every dang day. XD One of those times when I have a lot of the same qualms, but they just don’t bother me. Yeah i’m still reeling! I can’t believe it’s real!!! I would never have said I wanted it to go this way, but I am 100% along for the ride. I love controversial reviews Mel! The Shadow and Bone seris went from 4,5 stars to 3,5 stars and ended in 3 stars for me …but I am in the minority. OMG IVE BEEN WAITING FOREVER TO READ THIS AND NOW. . 3 STARS? T_T crappp. I gotta fin out for myself! Great review Mel! I have to agree with you that it was very slow for the first part of the book and that ending was bad lol! But overall I thought it was a great book. Great review! Great honest review! I’m sorry you didn’t enjoy it as much as you hoped, Melanie! I haven’t read it yet but I’m planning to pick it up next month! Ah shame you didn’t enjoy this as much as you hoped. Great review though! I read this whole review because I have heard some mixed things about KoS and wasn’t motivated to read it, but this review made me really look forward to eventually picking it up (hopefully soon)! Great review. 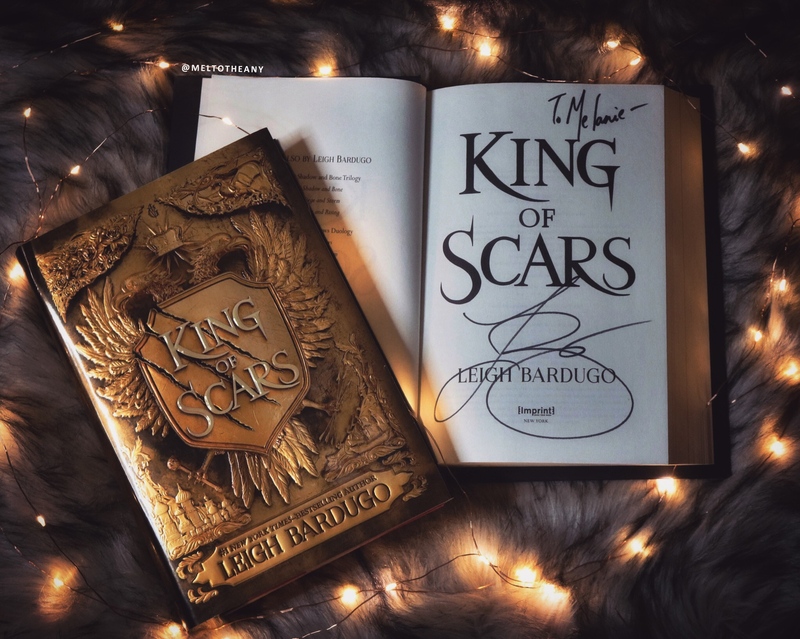 I refuse to review King of Scars. It has nothing to do with liking or not liking the book. 1) It is read by the actor who played Inej in the SOC/CK audible which after reading the books? I have listened to dozens of times. So it made me miss those books way too much. 2) I will always hold all YA books up to SOC/CK and that just isn’t fair. Well except her forthcoming adult book (as you mentioned) because it is an adult book, which she described as… what if Kaz went to college? Lol…. so it just wouldn’t be a fair review. Without spoiling anything I’m holding out hope (a fools errand I’m sure that somehow the dregs join the drama in the second book of this duology). Having said all of that… I do love Nikolai. He is the only thing that got me through the SAB trilogy, which I never planned on reading until KOS was announced. And yes I agree Zoya is the best thing in this book, which pains me because I love Nina. Oh my gosh… now I am forever going to picture Kaz in college and I’m so thankful for you and this comment! But yeah.. I am crossing everything the dregs manage to work their way in book two! I think it could TOTALLY happen! Reblogged this on Novel Lives.